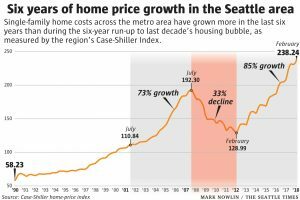 Single-family home prices in the Seattle metro area have grown faster than anywhere else in the country for the last year and a half, with no sign of slowing, even though prices have been surging for six years. The most recent Chase-Schiller* national housing report marked six years since home values bottomed out in February 2012. Since then, area values have increased 85%— nearly triple the region’s historical average for a typical six-year span. Only San Francisco and Las Vegas had bigger gains during that period. A recession or other unexpected development — like a collapse at Amazon a la the Boeing bust of the 1970s — could change that. But for now the real-estate market shows no signs of slowing down amid record low supply of homes for sale and strong demand for home­ownership. The report marked six years since home values bottomed out in February 2012. Since then, values have increased 85%— nearly triple the region’s historical average for a typical six-year span. Only San Francisco and Las Vegas had bigger gains during that period. Home values increased 1.7% from February to March 2018, according to the Case-Shiller data. The last time prices went up that much in a month was last summer, 2017. The recent boom locally has completely wiped out the effects of the recession on the housing market, when prices sank. Local home values are now slightly higher than they were at the height of the bubble in 2007, even factoring in for inflation since then. Yet, there are no clear signs that we’re in another bubble. The number of people defaulting on their mortgages locally is minuscule, for instance, and lenders are only issuing mortgages to people with good credit scores and financial assets. *Chase Schiller Report; monthly housing report covering 20 U.S. regions.